Our always popular 6-Hour Live Notary Public Education Seminars are designed to prepare all new and renewing notary publics to pass the State Exam on their first attempt. We'll not only discuss the latest laws and regulations, we'll also review the fundamentals of Jurats, Affidavits, the Journal, fingerprinting, forms of identification, sworn statements, and more. By the end of the day, you will be prepared to pass the State Exam, which will be presented at the end of the class. Those who have never held a Notary Public Commission. Any Notary Public who is renewing late or may not renew on time. Anyone who prefers a classroom-like environment. 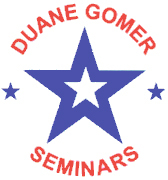 Seminars start promptly at 8:30 am UNLESS otherwise noted. Seminar is completed at 3pm. State Exam starts at 3:45pm. Click on the button next to the location that you would like to attend. Copyright ©2001 - 2019 by Duane Gomer Education. All Rights Reserved.